We supply a wide range of wholesale hot chocolate for business and trade. Buy bulk hot chocolate from top known brands including Cadbury, CafeDirect and Options Drinking Chocolate sachets, plus a range of Batchelors Cup-a-soup wholesale soup packets. 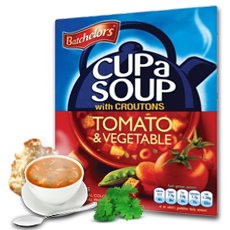 We carry a large stock of wholesale soup and hot chocolate supplies ready to buy for next day delivery to your business. To find out about our very competitive pricing, and to place an order, call us now on 020 8752 0110 or enquire online to open an account.